Millions of migrants have flocked to the urban centers of China in search for a better quality of life. For every family that attains this, there are a thousand more that live in abject poverty from day to day. Residing in a legal world that is a no-man’s-land, the migrants lack access to basic social services that so many of us take for granted. With thousands more migrants coming every day to seek a better life for their children, it appears there will be little letup of this flow of humanity for some time to come. 43% of the population already live in urban areas (ADB, 1994-2004) and 53,519 more people are moving into the cities ever day (ADB and UN Population Division, 2005). Modern China’s economy and infrastructure is being built on the backs of migrant workers with Beijing alone home to 5 million migrant workers (Xinhua, 2007) and 500,000 migrant children (Global Envision, 2007). 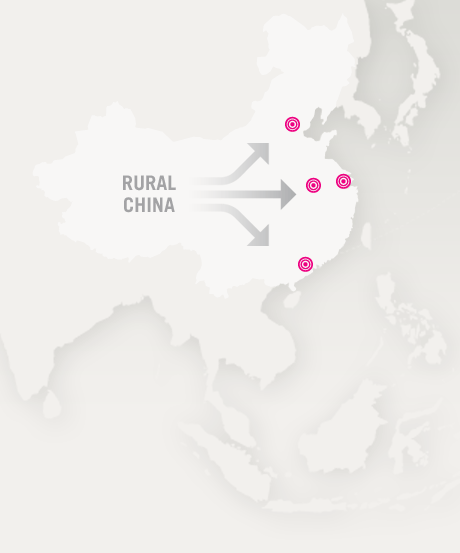 While China’s development is offering tremendous opportunities to those from it’s countryside, it also presents new challenges and uncertainties to those who choose to take the risk of moving their families to the urban centers. Migration to cities could prove to be a great blessing or a great threat to China’s surge towards a harmonious society. These combined factors are creating a situation which is unsustainable in the long run and needs to be addressed by the government, the public, and non-governmental organizations if there is to be a China in which basic rights are equally extended to each of its citizens. Because they fill the existing labor gaps, migrant workers often find jobs referred to as the “three Ds”: dirty, dangerous, or degrading. Inevitably, their children are the ones who pay the highest price. With no support network in the new city and parents working long hours every day, they are at risk of becoming the ‘forgotten’ children of China. As a result of China’s unique registration system (hukou), which ties each citizen to their place of birth, these children often end up on the fringes of society. Key issues they face are: sub-par education, inadequate healthcare, unstable residence, intense poverty, poor hygienic conditions, and low self-esteem. Unlicensed schools are the only option for the majority of migrant children and many of these buildings are dilapidated, overcrowded, and lack clean drinking water and proper lavatories.